From the cutting-edge of physical comedy comes an alternative version of events in the race to Antarctica, performed by the critically-acclaimed trio Gonzo Moose. Inspired by horror movies of the 1950s, The Thing That Came From Over There is a fast-paced rollicking ride, mixing paranoia, suspense and hilariously gruesome deaths. This unflagging, high energy show combines clowning, physical theatre and giant puppetry with the use of mad-cap props and non-stop visual and verbal gags. 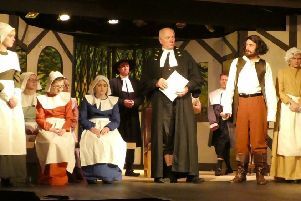 And the production will be on stage at Middleton Village Hall on Friday, February 23. Join three daring actors as they play more than 15 roles between them in 85 minutes of shocks, spine-tingling silliness, and blood curdling terror. It’s 1912, and as Scott and Amundsen begin their race across Antarctica, the hapless explorer Captain Reginald Cranston has accidentally landed on the wrong side of the continent. As Cranston and his motley band set up base camp, a meteor crashes nearby. Deciding to investigate, they set out towards the crash site, unaware of the danger that awaits not just them, but the whole of planet Earth. What ancient evil lurks inside the crater? What is the dark secret of the slimy fungus? And what is the horrifying fate of those who encounter the parasitic space worms? With comedy and thrills galore, The Thing is full of comic invention, lunacy and delight. Bristol based Gonzo Moose Theatre Company has teamed up with Highlights Rural Touring Scheme to bring the show to rural audiences across the North. The company is renowned for its accessible brand of comedy theatre and clowning. Tickets are available at www.highlightsnorth.co.uk or on 01670 772600.